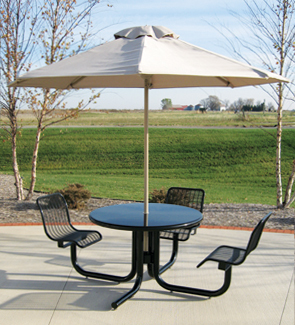 The functional style of the Courtyard Table with attached seats is perfect for your outdoor area. Choose from three, four, five, or six seats with or without backs. The 3 and 5 seat table offer a convenient handicapped accessible option, and all seats come in a wired mesh style. The Courtyard Tables are easy to position using the stainless steel leveling plates, and are also portable for relocation if desired. 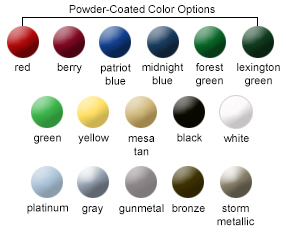 The table top, seats, and frame can be powder coated in a wide variety of colors, or you can opt for a stainless steel table top for maximum protection from daily use and weather elements. Table are available with a 2" umbrella hole. Umbrellas sold separately.